Despite some awfully cheesy songs , I really do identify with the music from that year. I spent hours listening to The Cranberries, Melissa Ethridge. I think I had that Lisa Loeb song on repeat for a good 6 months (taped off the radio of course, with the inevitable announcer’s voice cutting into the song). And I’m still looking for a man like the one Salt-n-Pepa kept singing about. This all got me thinking about the types of food I identify with and when those connections were made. My taste in food, like my taste in music, has changed over the years. Some foods I’ll always love though, and those loves were forged way before my 14th birthday. Grilled cheese sandwiches, my moms pancake soup, stuffed vine leaves (random, I know). And, of course, cookies. As a kid I would have told you that the classic chocolate chip cookie could not be beat, but I would have been wrong. 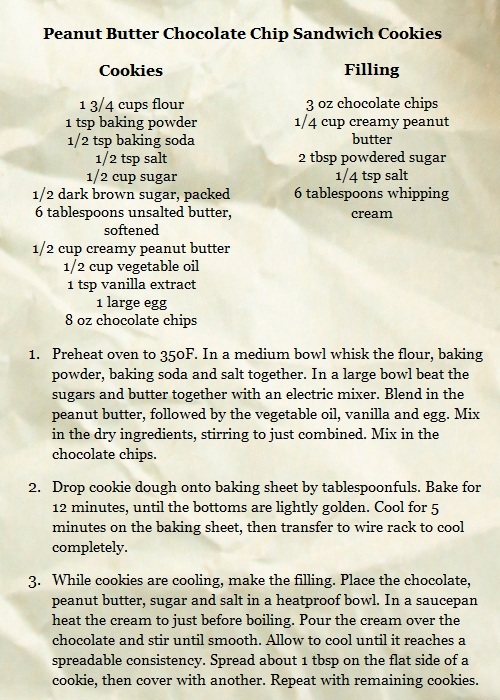 All you need to take chocolate chip cookies to the next level is a little peanut butter, another childhood favourite. If you want to make them out of this world, just sandwich some chocolate and peanut butter filling between two cookies. I made these for the Super Bowl under the guise of “go big or go home”, and they did not disappoint. The cookies should be a little chewy, so be careful not to over bake them or they’ll get too crisp. The recipe makes about 36 cookies, or 18 sandwiches. Recipe adapted from Bon Appetit. I think chocolate chip cookies are one of the greatest comfort foods of all time. These look great, and I can’t wait to try them. These look so delicious! 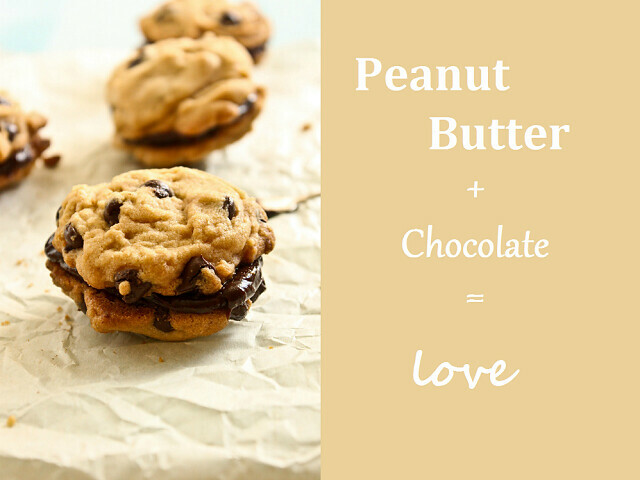 Can’t beat the peanut butter and chocolate combination, and these really take it to the next level with the filling too! 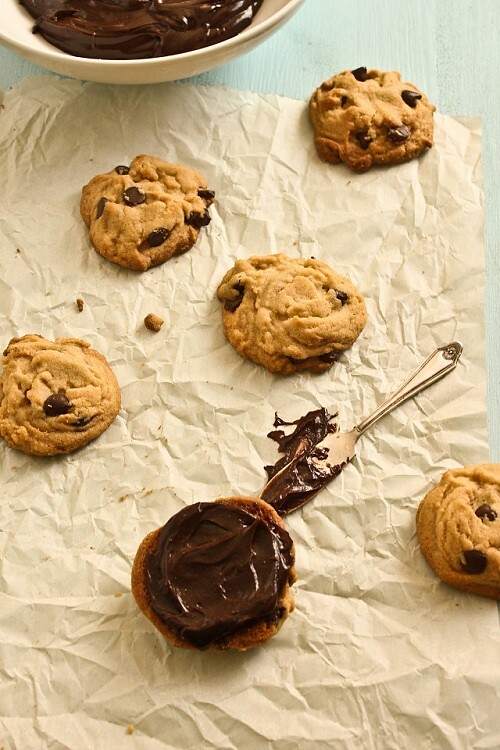 PB + Chocolate is a super delicious combination. Your cookies look fabulous. These little babies look amazing. I was ten in 1994 but I know all of those songs. I would scream I the Meatloaf one and still get excited if I hear it on the radio. I fixed the link. Thanks for letting me know it was broken! I would eat about 40 of these. Holy crap! OMG these sound amazing! 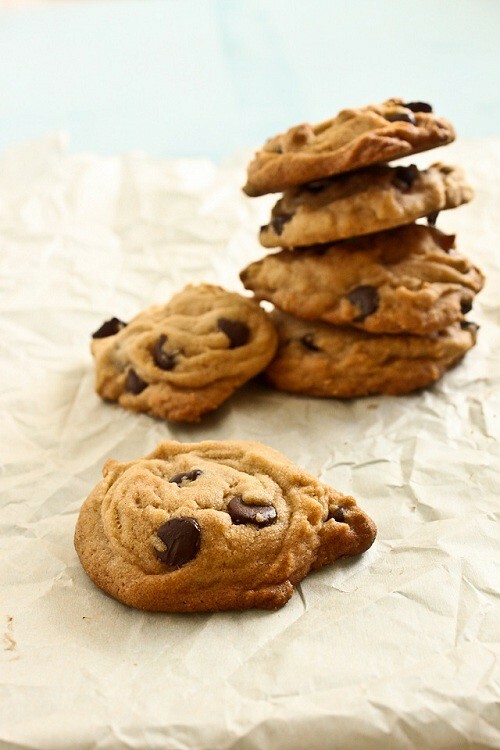 PB Chocolate Chip, yes! Love the Salt & Peppa comment ha!! And what is pancake soup? It sounds divine! Pancake soup is something my mom always makes when I’m not feeling well. It’s basically chicken soup with sliced up crepes instead of noodles. I’m not sure if it’s a Polish thing or just something she came up with. I love it, I’ll have to post about it one day. You’re killing me with these cookies, I think they are a vision of perfection! 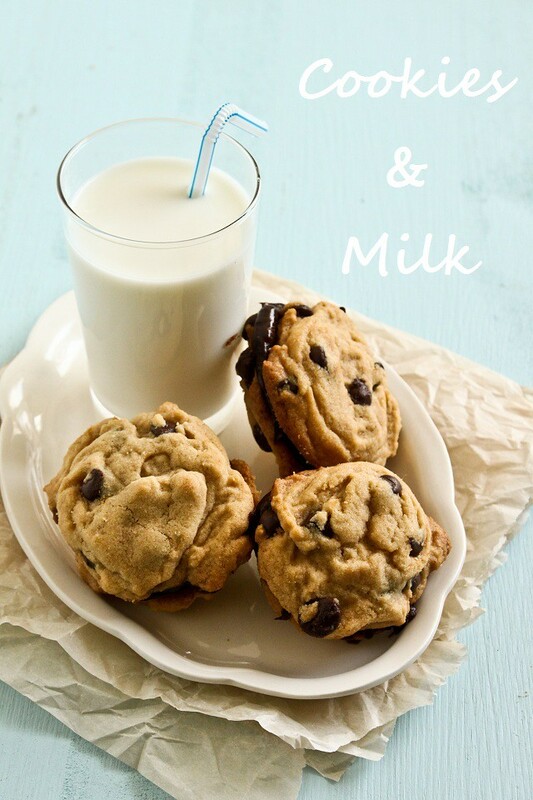 I know this isn’t the object of your post… but wow that glass of milk looks good next to those cookies! I love the music memories as well…tee hee… tootsie roll. Oh, you got me all 90´s nostalgic here! Cranberries, and Lisa Loeb – I´d almost forgot about her! Your cookies look absolutely divine – I partcularly love that you´ve sandwiched them! ;) And cookies are a favourite of mine too! Oh gracious, these look heavenly! All I want for Valentine’s Day is for someone to bake these for me!! I want a plate of these babies now! And I so remember Lisa Loeb and Salt n’ Pepa….loved listening to them!